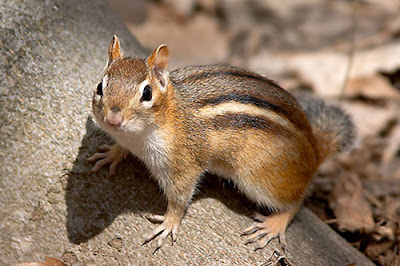 The Chipmunk is the smallest member of the squirrel family.Chipmunks seem to be the best dressed of the species, sporting a "Striped" suit & a thoroughly adorable face! 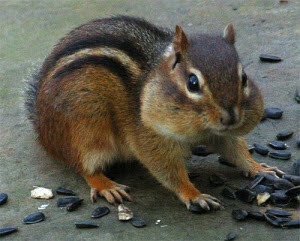 Chipmunks possess phenomenal energy & are remarkable managers of their environment. 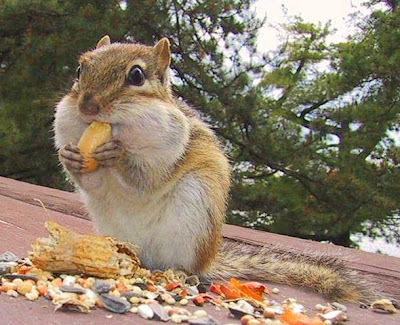 The name Chipmunk, or Tamias, means "one who lays up stores". Hard work & perseverence characterize their preparations for the winter, allowing them to gather an adequate food supply for themselves & their family. 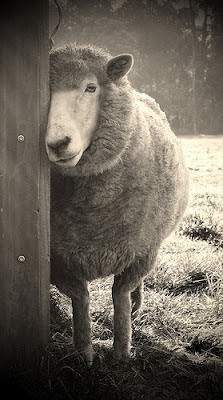 Ewe may think I'm nuts, but I work very hard at being adorable! Chipmunks have an exceptional sense of smell that aids them in finding food in the spring, summer, & early fall.They labor from dawn to dusk ,frantically gathering seeds, nuts, & kernels which they will store in an elaborate system of underground tunnels & chambers! This burrow, consisting of a bedroom,toilet, listening post, & storage bins, serves as their refuge in the winter. Here,they will sleep often, only waking to eat! Are Ewe Nuts? "These Cheeks are made for Storing, & that's just what they'll do"! Chipmunks are true "barbershoppers"! They love to sing a "Kuk-Kuk" song to their potential mate from the burrow's entrance! The female's response must be positive for him to enter, complying with proper dating rules. Mating will lead to a litter of 3-5 hairless, blind babies, which are nursed until able to eat seeds on their own. Can ewe keep a secret? Did ewe know that I rub noses as a gesture of affection? Sheep are very different from Chipmunks! First, they are unable to tirelessly work at gathering food in preparation for winter. Second, sheep do not construct & supply underground dwellings. Finally, sheep need help from an outside source,while chipmunks work independently! Bottom line is that sheep need a Shepherd to do things for them that they can't do for themselves! Ewe know we all "Need Someone to Lean on! While grazing today in the pasture the Good Shepherd has prepared, rejoice that Ewe have Someone to Lean on who is far bigger than any situation Ewe will face!